Business architects are having their moment in the sun as the importance of business architecture, and hence the role of business architects has been rising in the digital age. To be a successful business architect, it is essential to transcend from the perception of a person who draws boxes and arrows and become a catalyst for enterprise transformation. A great business architect is one that can operate at strategic, conceptual, and execution levels and can act as the bridge between various enterprise teams. A Business Architect is a practitioner of business architecture and acts as a bridge between business and technology, develops capability maps and other artifacts, and helps in the operationalization of strategy, and assists in the technology enablement of core capabilities and value streams. What does a Business Architect do? 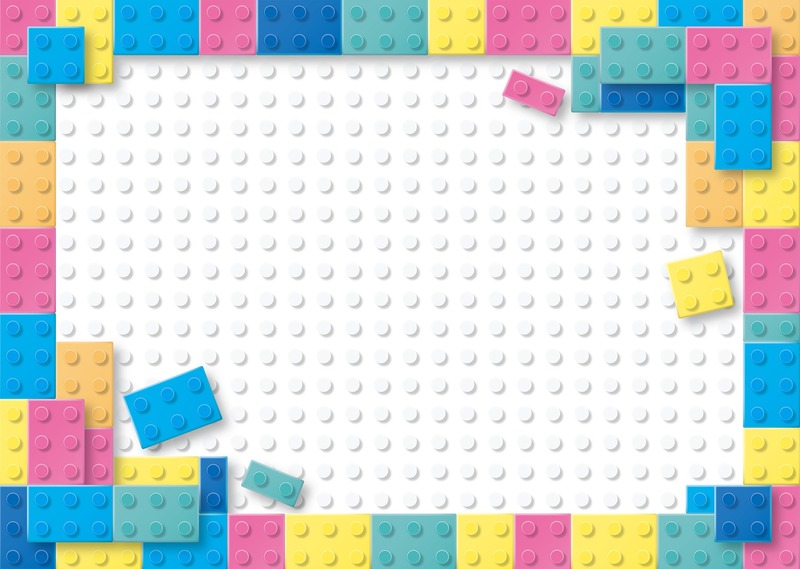 A great business architect can function as the glue that binds various facets of an enterprise and is at the vanguard of enterprise transformation. 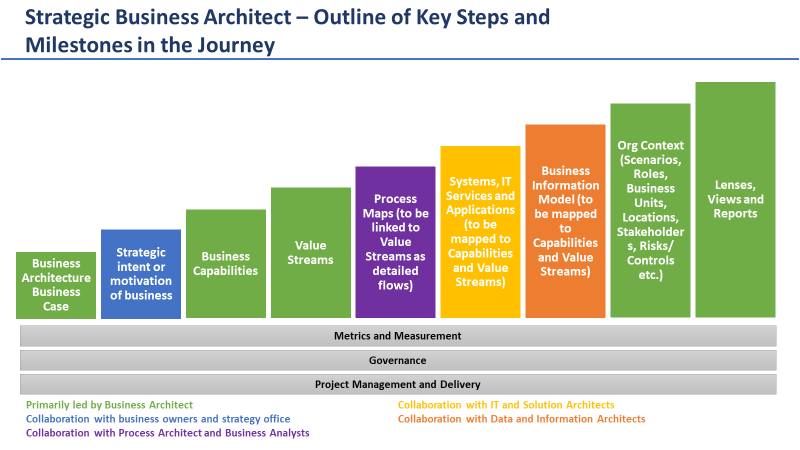 A business architect works alongside enterprise architects, business strategists, product (service) owners, and technologists to provide business architecture inputs to drive overall enterprise architecture and enterprise design. Craft business capability maps and defines the capability attributes. Conduct capability assessments including a future state maturity at a capability level. Work with product owners, user groups, and business analysts to align requirements/backlog to capabilities. 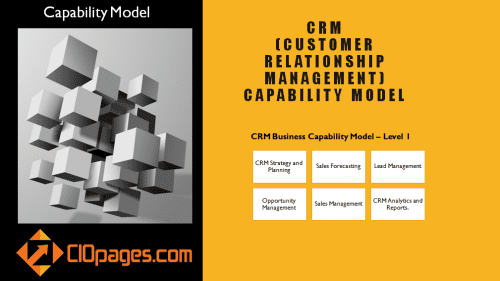 Work with data architects to overlay the business information model to capabilities and systems. Work with solution architects and technical architects to map systems and services to capabilities for footprint analysis of what systems/services support which capabilities. Work with corporate and business strategy teams to assess the strategic plans’ impact on various capabilities and document the maturity needs at a capability level. Support teams in providing business architecture inputs and perspectives. Develop various viewpoints, lenses, and mappings to show relationships, juxtaposition, linkages, overlaps, and footprint. What are common backgrounds and qualifications of a Business Architect? Historically, many business architects came from a broad technical background, and it is one of the unfortunate happenstance that made business leaders consider business architect to be a tech discipline and business architects to be technology folks. 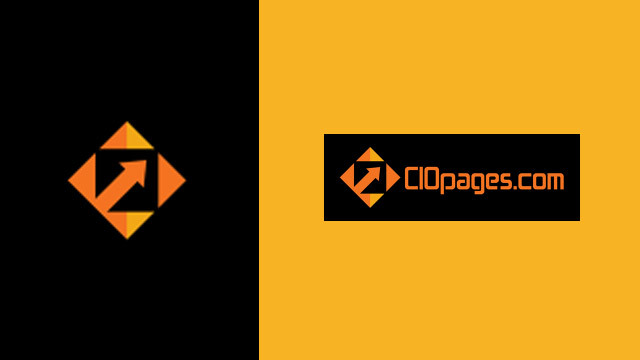 However, our view at CIOPages.com is that business architects must have in-depth knowledge of the business and should report into the business side. 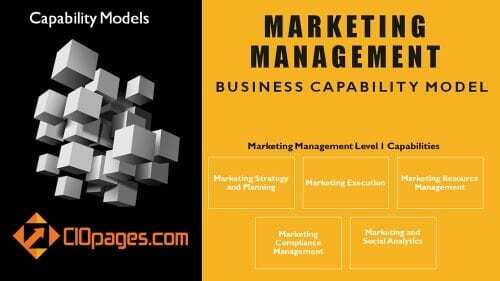 Deep understanding of the business, its products and services, and general business landscape. Basic understanding of the strengths, weaknesses, opportunities, and threats facing the business. Ability to demystify corporate and business strategy and operationalize to link execution to strategy. 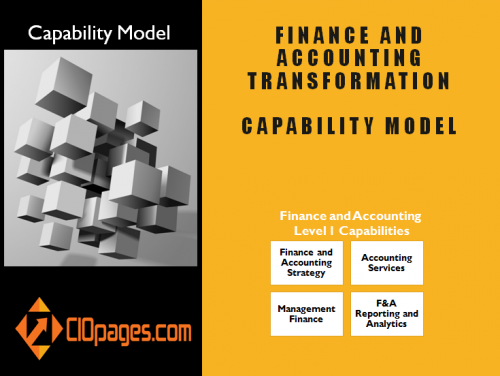 Ability to abstract what the business does into a coherent and cohesive business capability model. Ability to abstract business flows and processes into higher level value streams. Collaboration skills to work with product/business owners, corporate/business strategists, and other architects (enterprise, data, solution, services, infrastructure, solution, and technical architects) to develop various views, viewpoints, lenses, mappings, assessments, and heat maps. Communication skills to evangelize the discipline of business architecture up and down the corporate chain of command. Persuasion skills to bring various teams to align around a common construct – the business capabilities. Ability to operate at a strategic level as well as drill down deep into details. Thorough understanding of the concept to technology enablement lifecycle. Agility to provide business architecture inputs at various levels – simple to complex, and coarse grain to fine grain. Ability to switch contexts and be comfortable with working with business, technology, operations, and architecture teams. Many business architects come from technical work histories including programming, technical analysis, and systems analysis, etc. Product managers (and product analysts) also make good business architects. Corporate and business strategy is another background that helps in big-picture thinking and makes good business architects. Analytics is also a field that can provide a solid grounding for business architects. Consultants (business and technology consultants) may also have sound skills to make great business architects. What deliverables does a business architect develop? Business architects are responsible for some critical deliverables and collaborate on a slew of other artifacts. 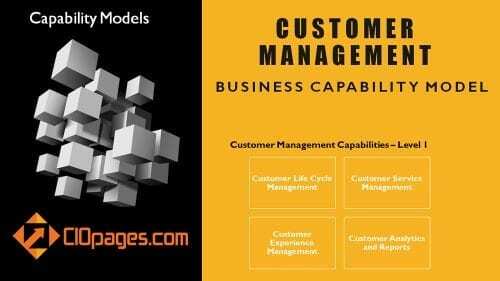 However, we believe that business architecture and business architects should focus on business outcomes not just creating models and views. That said some of the following deliverables have a substantive impact in various facets of enterprise planning, technology enablement, and operational optimization. What is a typical day in the life of a Business Architect? It all depends on the type of role, the business architects themselves, the enterprise, and the current state of business architecture. No two examples may be precisely similar. But we can broadly cover the type of things in a day in the life of a modern business architect at a technology-enabled company. 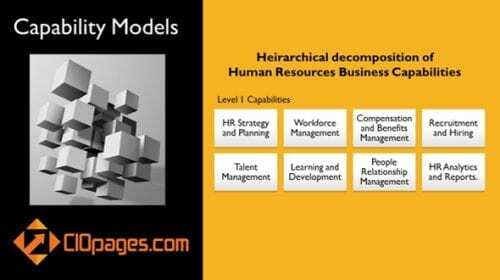 Foundational: Develop core entities or new models or views. Strategic: Participate or contribute to planning – annual planning, product planning, location planning, or transformation planning. Maintenance: Ongoing update and upkeep of various models, artifacts, lenses, and views. Reporting: Generate reports on various aspects of business architecture including management reporting, and operational reporting of areas of relevance. And if it is like any sizeable present-day organization, most of the time is spent in meetings and a small amount in actually doing the real work. Who consumes the work done by a business architect? Business architects are not just solo creators but are collaborators and participants in the enterprise transformation journey. The following are the key groups and individuals that consume the deliverables of a business architect. Planning teams: Strategic and business planning teams leverage business capabilities and associated heat maps. 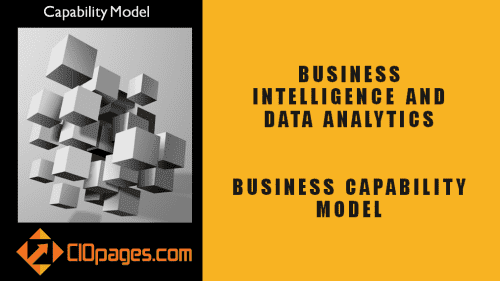 Business Analysts: Business analysts are a significant consumer of business architecture deliverables typically focusing on the specific and micro aspects relating to the projects they are overseeing. Enterprise Architects: As business architecture is an integral part of the business architecture, enterprise architects are key collaborators as well as users of the business architecture models and artifacts. Technical and Solution Architects: Solution architects and technical architects use various business architecture inputs in defining the technical and solution architectures. Corporate Budgeting: In organizations that are capability-centric, and where capital budgeting happens at capability-level (and not purely project level), business architecture assessments and heat maps and need analysis to constitute a critical input for funding and allocation decisions. What is the career path for a business architect? Business architecture is an emerging discipline, and its profile is rising in the digital and cognitive age. Business architects may shape their careers in different ways based on their aptitude, qualifications, interests, and achievements. A business architect may transition to corporate or strategic business planning position. For those business architects whose background is in the business, there is a clear path to become a product manager overseeing the end-to-end lifecycle of a product or a service. For those who are technically inclined, senior leadership positions in information technology are a natural transition. And of course, as business architects add value not just at an operational level but in strategic areas, the foundation in business architecture will indeed be a good training ground for becoming a CEO. How do I get a Business Architect Certification? Business architects should focus on not just obtaining a business architecture certification but about learning and development. In addition to formal certificates, there are many ways to learn the craft. Business Architecture Guild is one of the premier industry associations and offers a certification. Business architecture center of excellence provides business certifications and workshops. The Open Group, (of TOGAF fame), provides a certification program in Business Architecture Stream. Leading Practice com Global University Alliance collaborate on offering a Business Architect Certification Program. Business Architecture Institute is a source for articles and presentations about business architecture. Cutter consortium is an excellent source for thought leadership on enterprise and business architecture. Many bloggers such as Nick Malik, Ralph Whittle, Jeff Scott, William Ulrich, provide valuable perspectives about business architecture. Capstera offers a slew of articles and thought leadership pieces on their business architecture blog. The analyst and research firm Forrester offers a playbook on business architecture. Capstera, the makers of business architecture software have a list of business architecture books. How much salary does a Business Architect make? Nationally, across the United States, in 2018 the business architects earn between $101,000 and $169,000 with an average of $135,000. Senior business architects make between $119,000 and 194,000 with an average of $155,000. Of course, these are averages and ranges. The actual salary a business architect may earn depends on a variety of considerations – including the role, the scope of work, the level, the sector/industry, the location, and the firm itself. For example, a business architect in a small company in the Midwest may earn $90,000. On the other hand, an SVP (Senior Vice President) of business architecture may receive compensation of $300,000 similar to his/her peers at the same level. Your best bets for real salary information for business architects as well as other professions is Glassdoor.com or Payscale.com or Indeed.com. Where do I find Business Architect Jobs? You will find business architect jobs in popular job boards as well the professional social networking site, Linkedin. More than job listings, referrals play a key role in unearthing jobs that are not publicly available as well as influencing the hiring managers’ decision. 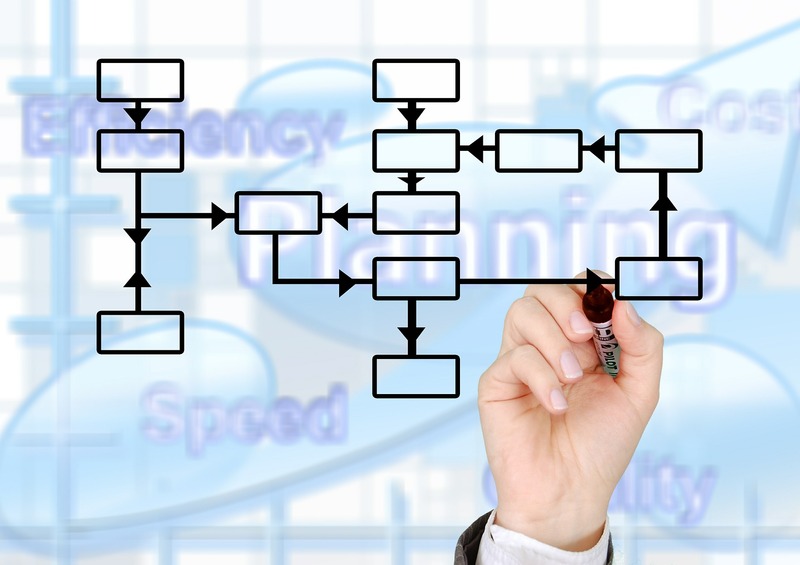 Business architects use some common office productivity applications as well as specialized tools and software for modeling business architecture. The following are just a sampling of the tools available. Please conduct your due diligence for other available options, fit for your purpose, cost, deployment options, and licensing terms. Office productivity applications – Microsoft Word, PowerPoint, Excel (or alternative Google Docs) or similar tools.